Earning-My-Cape: A Bunch Of Thanks! Next Party Theme! & Award! A Bunch Of Thanks! Next Party Theme! & Award! Hi! First off, I would like to thank everyone for coming to my Blog Party- Pinterest Style! I think it was a great success for my first party! I hope you all had as much fun as I did! I am already planning for my next party. I kind of just came up with the idea for the first one, and jumped in both feet first, so this time, I will do a little more planning. I was thinking of a themed party! I was also thinking that I will run it for an entire week, since some people are online more during the week, while others are online more during the weekends. As for the next theme... in honor of St. Patrick's day, we will be celebrating: GREEN! Search your site for green and pin it between March 12-19, 2012. Be creative and join in the fun! I look forward to seeing you all there! 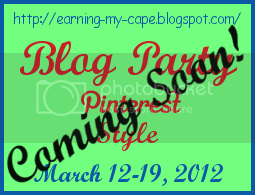 Check out my new BLOG PARTY page for more info on how my blog parties work. I am very proud to accept the Liebster Blog Award from Sarah at Homestyle Cooking Around The World!!! -Present the Liebster Blog Award to 5 blogs of 200 followers or less who you feel deserve to be noticed. Thank you so much, Sarah! For those of you who have never visited Sarah's Blog, I encourage you to do so! She has a ton of yummy recipes and beautiful pictures to match. I can seriously spend hours there just looking at everything and deciding what I want to make first! Just take a peek at these Chunky Pecan Pie Bars and these Chinese Pot Stickers/Dumplings, and you will see what I mean! Now it's my turn to "pay it forward". I have chosen five of my favorite blogs with less than 200 followers. These are great blogs by some very creative, artistic, and talented bloggers. I hope you will take a few minutes to check out their awesome blogs! Thanks so much Susie! This is fun! I am busy looking for things green for the next Pinterest Blog Hop! See you then!